A bed canopy adds a romantic look to any bedroom. If you like the look of a canopy bed but don't have the money to buy one, make your own for very little. No sewing is involved in this project and it is a snap to put together. The hardest part will be picking out what type of fabric you want. Determine how much fabric you will need. Measure from the ceiling to the floor and multiply by 2 (A). Next measure the width of the bed and add 12 inches (B). Add the two measurements A + B together (C); add 36 inches to C. This is the total number of inches of fabric you need (D). To find out how many yards of fabric you need, divide the total number of inches (D) by 12; then divide this new number by 3. This is the number of yards of fabric you will need to buy. Always round up to the nearest whole number. Measure for the placement of the curtain rings. Measure the width of the bed; add 12 inches to this measurement. Open the measuring tape out to show this measurement. Have someone hold the measuring tape up to the ceiling centered over the head of the bed; place a mark on the ceiling at both ends of the measuring tape. This is where the curtain rings will be attached. Attach a curtain ring to each mark you made on the ceiling. Be sure the hardware you use to attach the rings will be able to hold the weight of your fabric. Anything heavier than a sheer fabric could pull too much on the rings. Drape one end of the fabric through the curtain rings from left to right. Pull through until the ends on each side of the bed are even. Now gently pull down on the fabric hanging between the rings to drape it slightly; pull open the material to flair out the fabric and make it look more full. 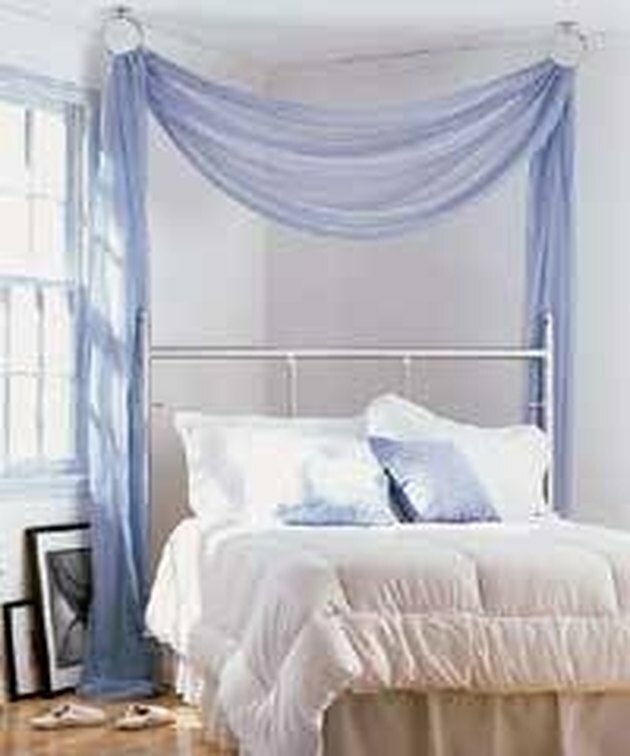 Pull out the fabric hanging on each side of the bed and let it drape gently on the ground.